7pm Thursday September 13 Entry – There’s nothing really changed much today. Florence moved close to the coast and basically stalled most of the day and wobbled around. The intensity stalled pretty much the sames despite eye wall replacement cycles and dry air intruding into the eye. 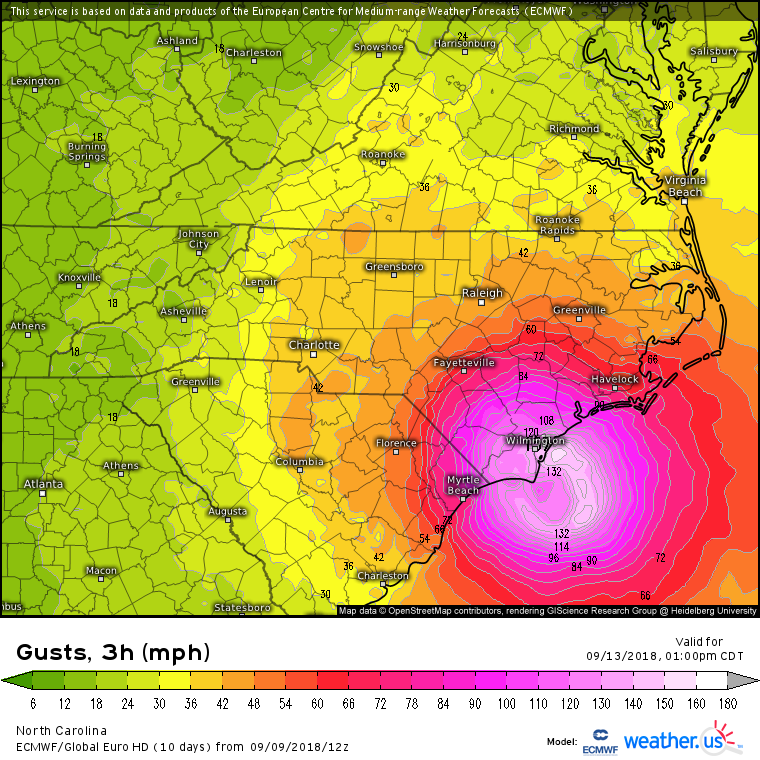 Over the next 24 hours, Florence will gradually wobble toward the coast and should make landfall sometime Friday near the SC/NC state line. A slow movement toward the west is expected per most of the operational models. 8am Thursday September 13 Entry – So overnight a little shear impacted Florence so the intensity was dropped to Cat 2. It appears the shear is relaxing and the eye is is becoming closed again as new convection develops so will not be surprised to see the intensity go back to a Cat 3 on afternoon advisories. The models seem to cluster the storm along the coast then take it inland over northern South Carolina. ECMWF remains the southern most track but given it’s lack of consistency I am throwing it out and leaving the track Steve and I came up with. 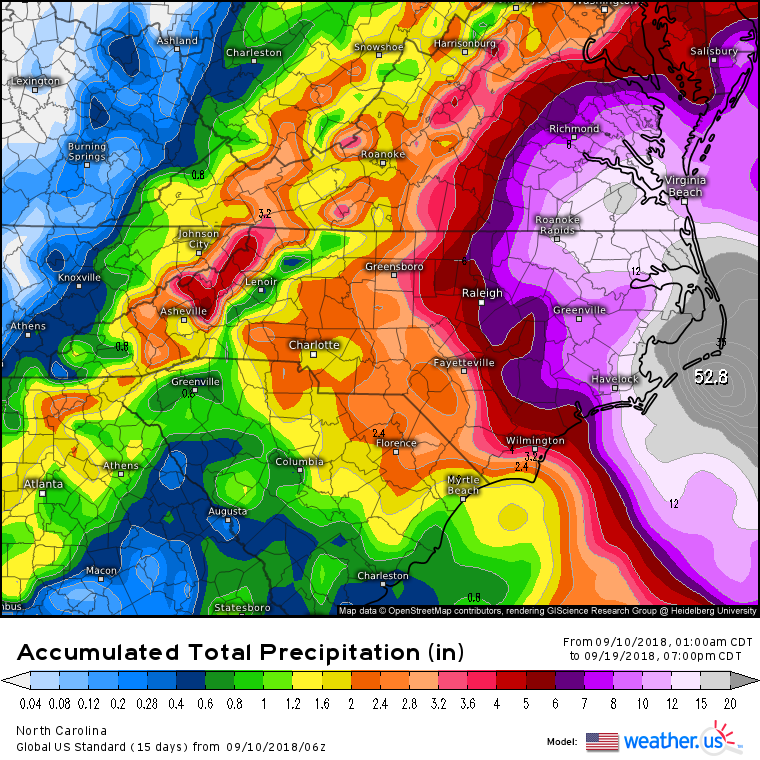 There are people I have been urging to get off the coast in North Carolina but they think this is a normal storm. It’s not. Never have we seen a storm come from this direction and this powerful so if you stay, good luck, your not getting out for days. 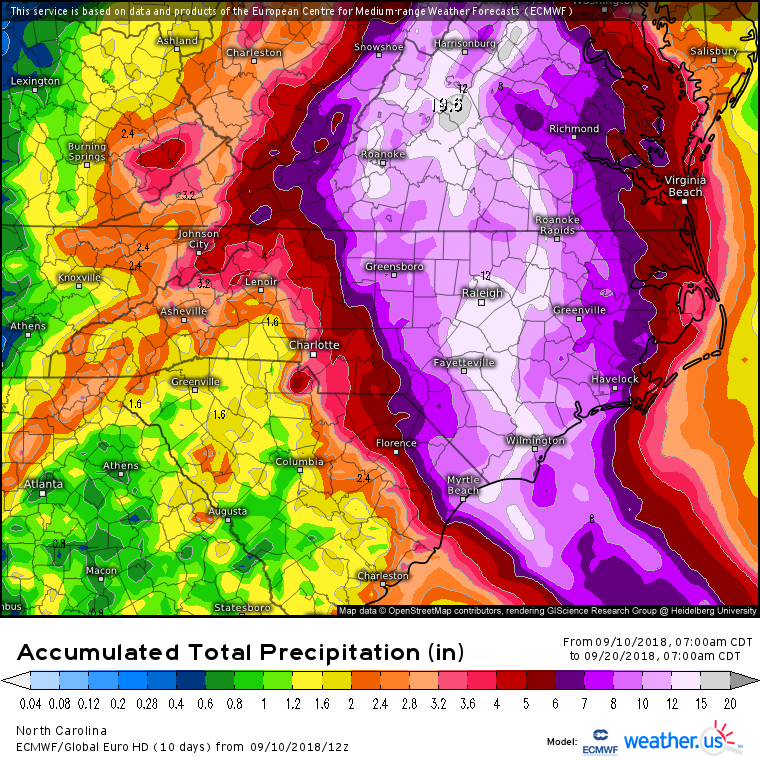 Next issue will be flooding all the way to the Northeast. I will be adding information about that. 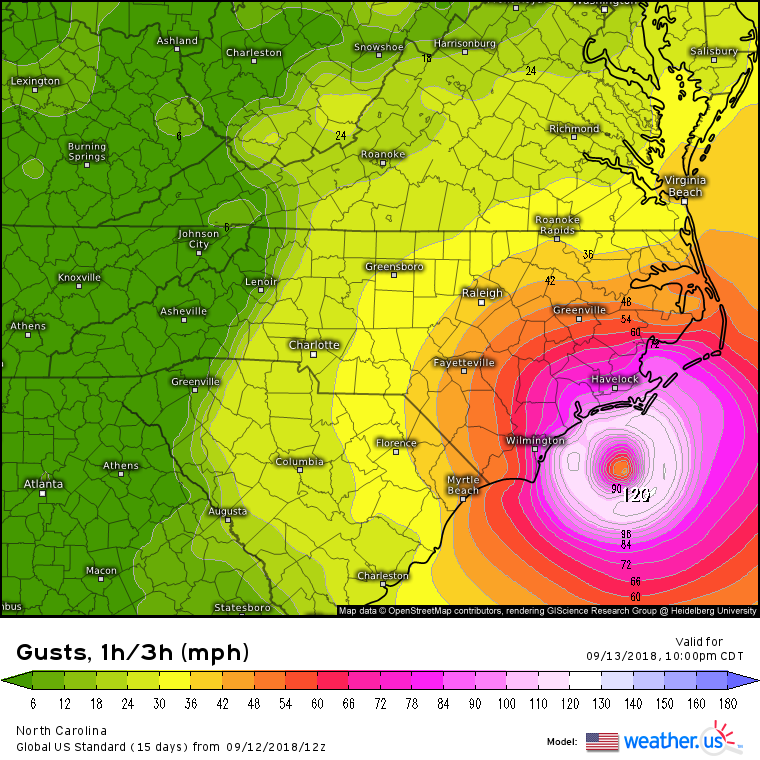 Here is a link to the NHC Track Map and Hurricane Models. 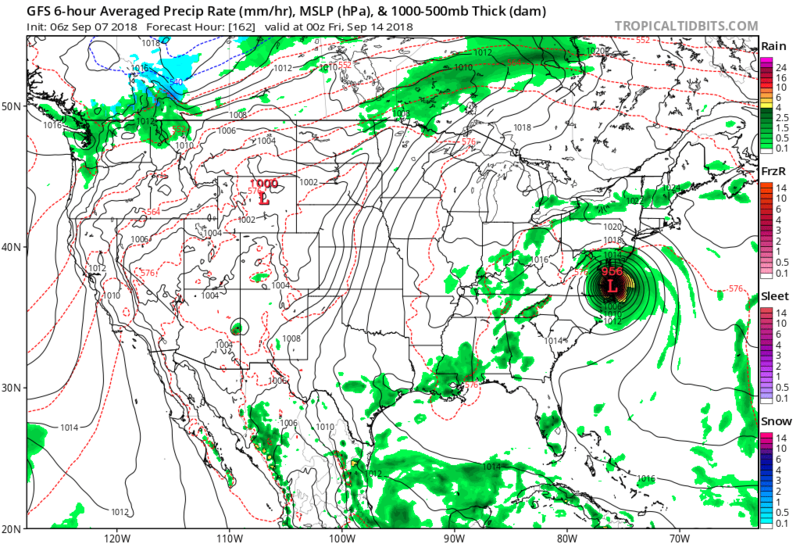 Noon Wednesday September 12 Entry – GFS remains fairly consistent with a slowing track to the North Carolina coast then a small loop to the south before heading across northern South Carolina then up and over the mountains. Pretty much on the track I showed this morning below. Coast gets ripper apart with over 100 mph. 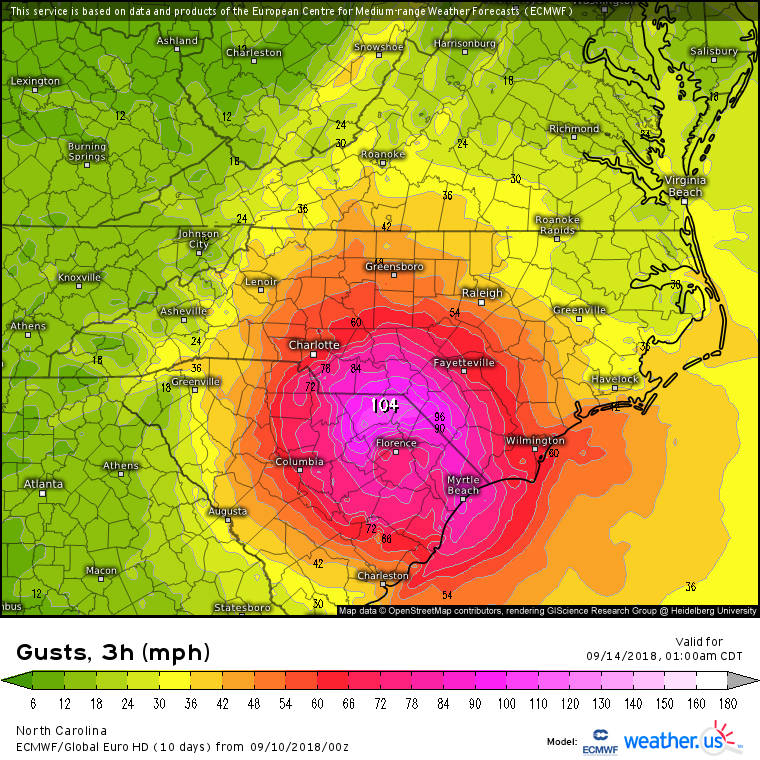 The only saving grace for Wilmington, NC could be the eye stalls over the city keeping the winds outside of the city while the storm weakens. If that happens it would be amazing. Given the GFS, I am getting more concerned for more flooding up the Appalachians into Pennsylvania where flooding was bad with Gordon. 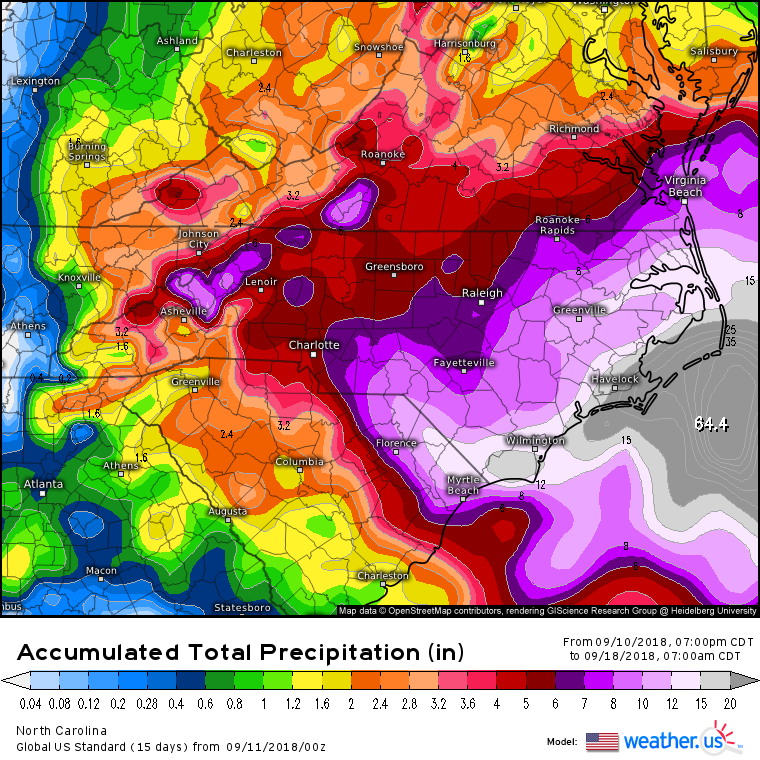 You can see on the total rainfall that areas up the Appalachians get crushed again. The NAM model for what it’s worth kinda of shows the same thing as the GFS. PLEASE LISTEN TO EMERGENCE MANAGER INSTRUCTIONS TO EVACUATE. 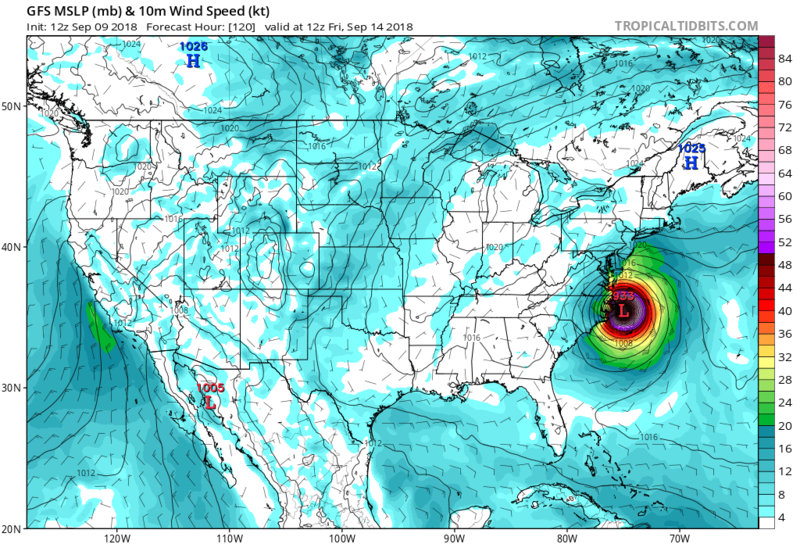 8am Wednesday September 12 Entry – Things overnight have become murky as models shifted south with the ECMWF going way south to an area that never has really seen a land falling hurricane. See image below. I did make my own track, just a simple map of where is think it will go. Basically, Florence reaches the coast, slows down, loops around for a day or so and then makes a westward movement and eventually heads into the eastern Ohio Valley late in the weekend and early next week. 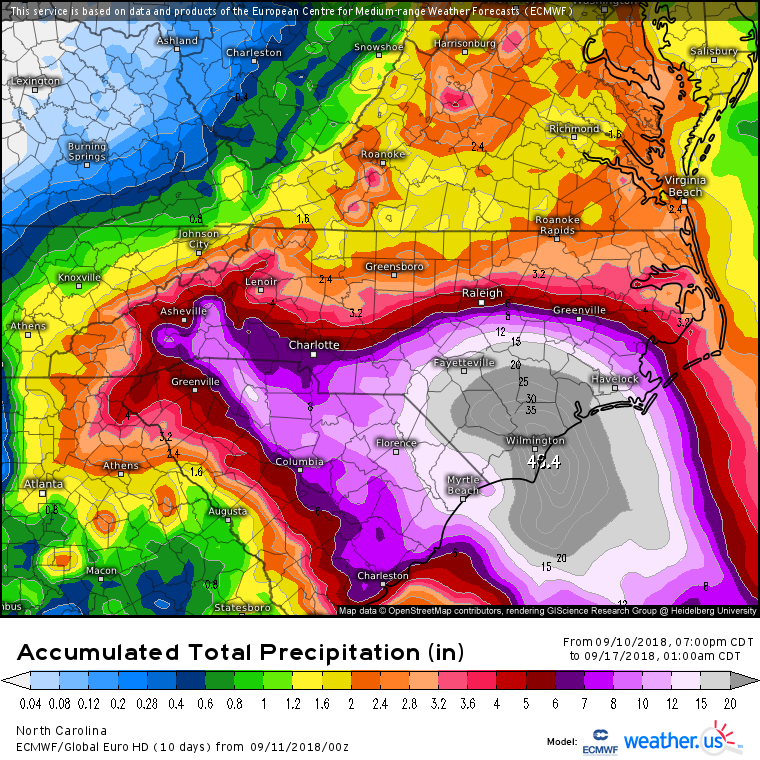 It stills means that the coastal areas are going to get ripped apart by a Cat 4 hurricane but what I am focusing on is the rainfall after landfall. 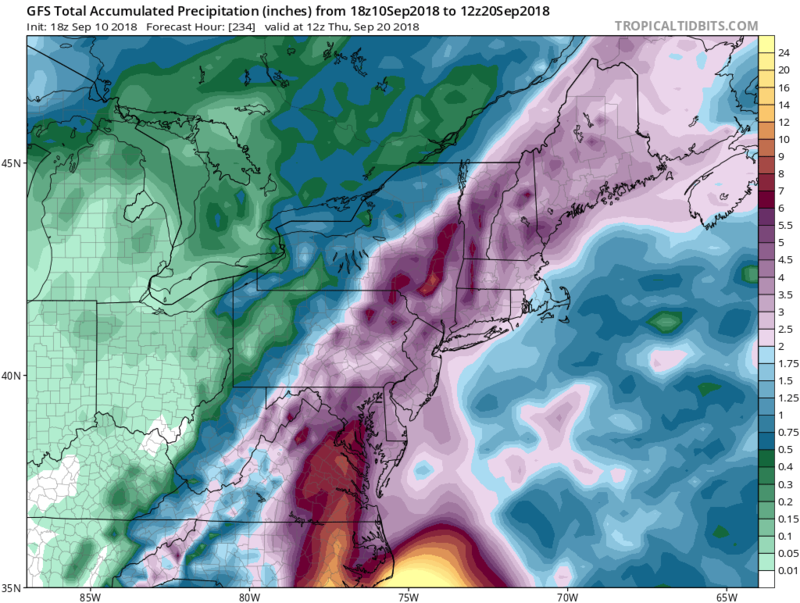 On the track I am showing, the heavy rains head into the mountains then up the Appalachians which means more heavy rains for the areas hit in Pennsylvania. There will also be an area of heavy rain going through Kentucky into the eastern Great Lakes that can also produce flooding. Nothing is clear cut with a stalling hurricane so stay tuned as things change. 5pm Tuesday September 11 Entry 3 Days until Landfall – Not much has changed this afternoon. ECMWF went way south which does not seem right. GFS went way west. Also still show NC hit as major hurricane but end game and where the floods after North Carolina will go is still up-in-the-air. I really don’t have enough evidence to say this way or that way given the pattern. 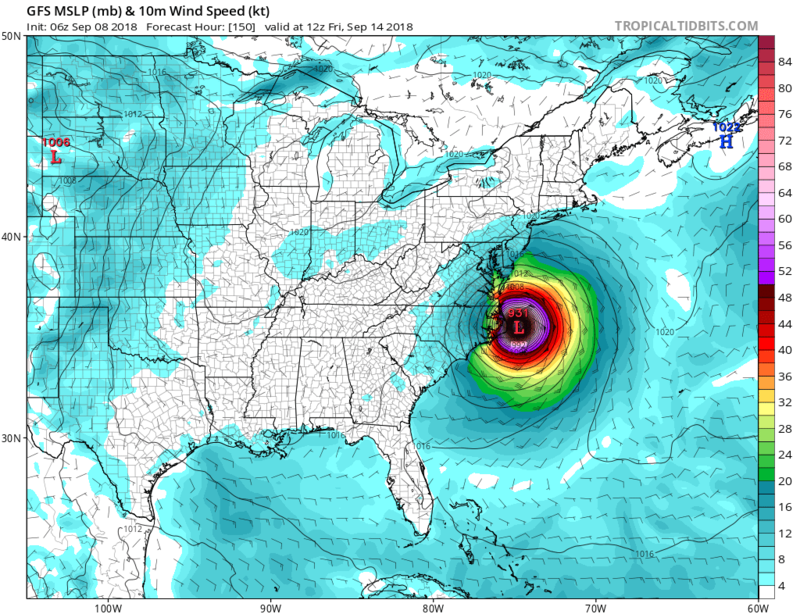 Hit on the coast will be somewhere near Wilmington as a destructive hurricane that will rip apart the coast which we are sure about, after that is where the uncertainty comes in and there’s still the stalling and looping aspect that has to be figure out. While it’s a big storm, things are still not clear on the outcome. 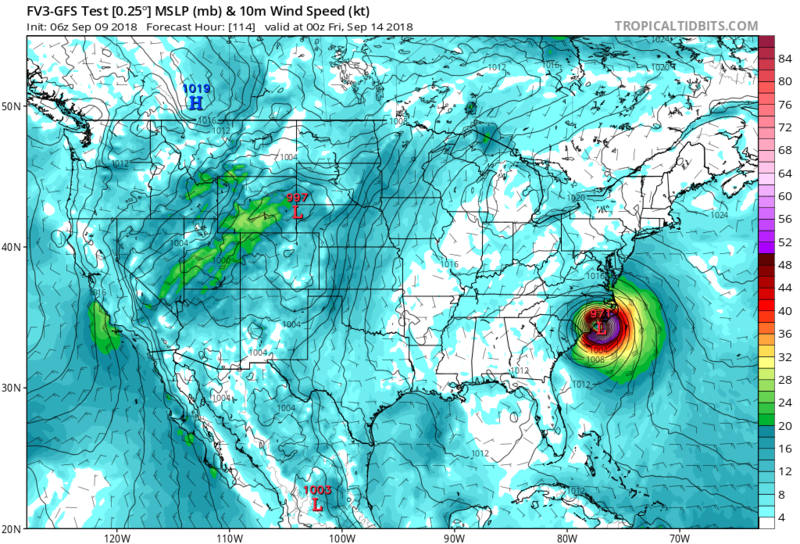 7am Tuesday September 11 Entry 3 Days until Landfall – So today’s issue is the stalling and looping of Florence. When and where does that occur. 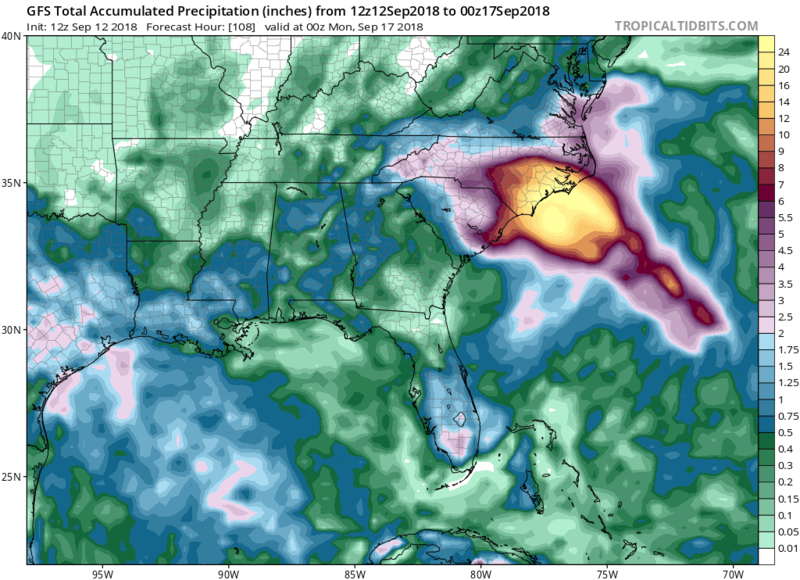 GFS remains bullish that it occurs along the coast while ECMWF seems to be shifting around and now takes Florence into northern Georgia. 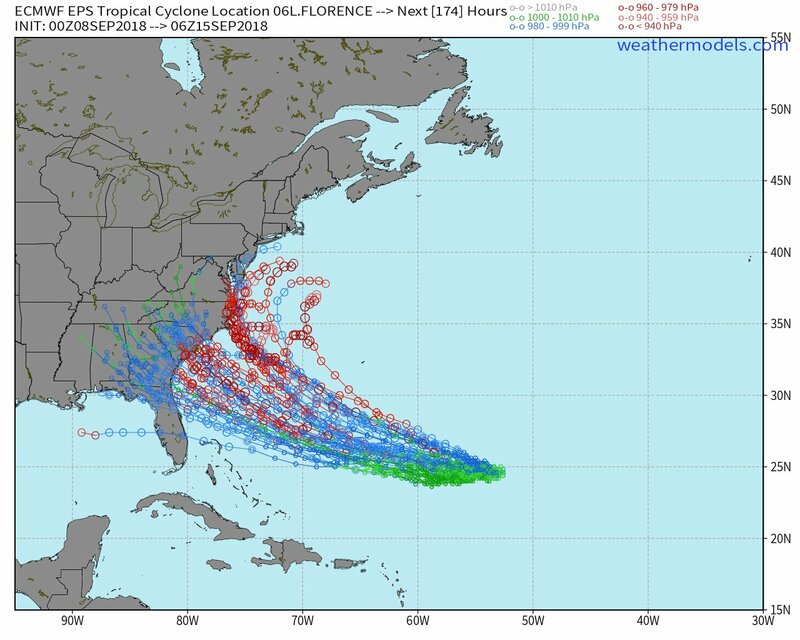 The hurricane models are not in any agreement on the end game, while NHC seems to be taking the middle road of driven Florence inland into North Carolina then stalling Florence for a few days. So why the issues. The ridge builds over Florence as the storm approaches the coast so the escape to the north is blocked off. We also have the system in the eastern Gulf that is building the ridge as well blocking any exit to the west. 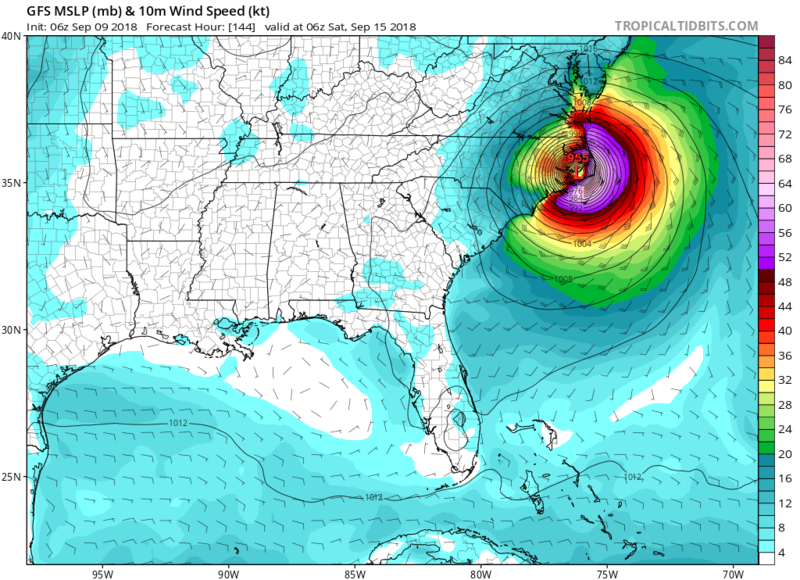 So Florence really has no where to go upon reaching the coast which will make landfall predictions tough, flooding and wind issues tough as well. 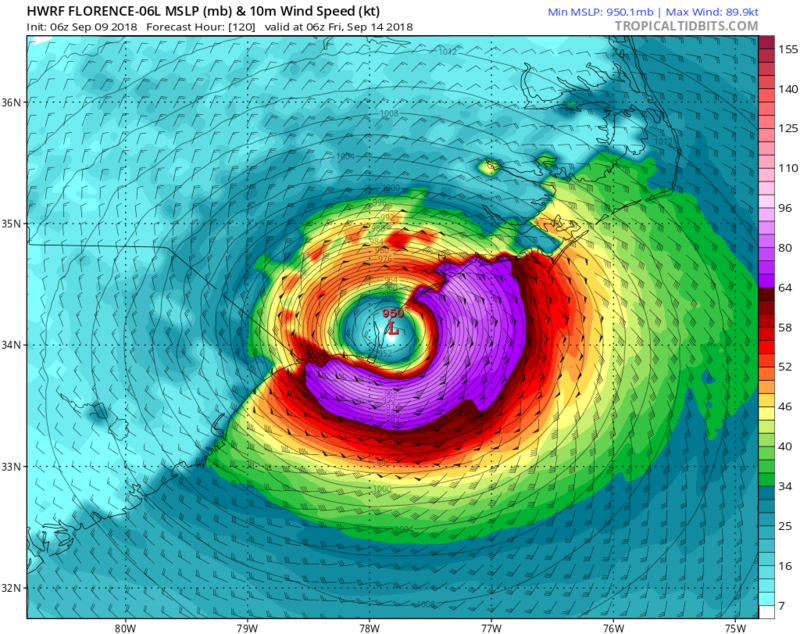 There is no clear end game to Florence so I think it will become dealing with Florence as the storm comes to the coast becomes models will continue to struggle. 9pm Monday September 10 Entry 4 Days until Landfall – Sorry for the lack of posts today been fighting Gordon’s flooding here in central PA. So what do we know this evening. NHC moved the track slightly north. Still a major hurricane hitting. 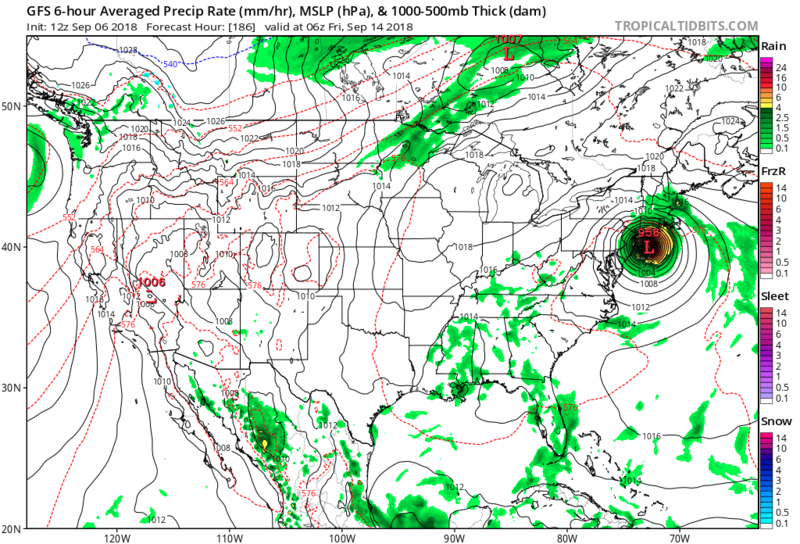 GFS continues to show the stall and loop before coming in and now has the flood disaster I have been worried about for weeks across PA, MD, NJ. ECMWF remains the same but the end game takes the system out into Ohio which does not seem right. If anything, the storm stalls and gets picked up by the trough and pulled northeast over the weekend. 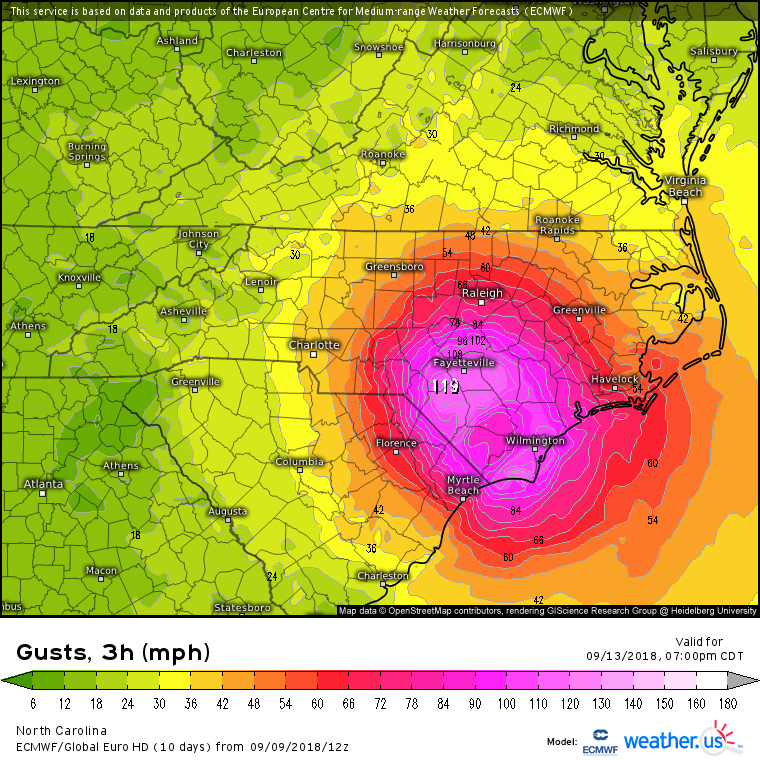 Landfall either way will be a disaster with winds over 100 mph and rainfall in feet. So the question on the track becomes where does the stalling take place. Off the coast or inland. I am not sure where I am leaning yet, but don’t get me wrong, Florence is a bad storm. 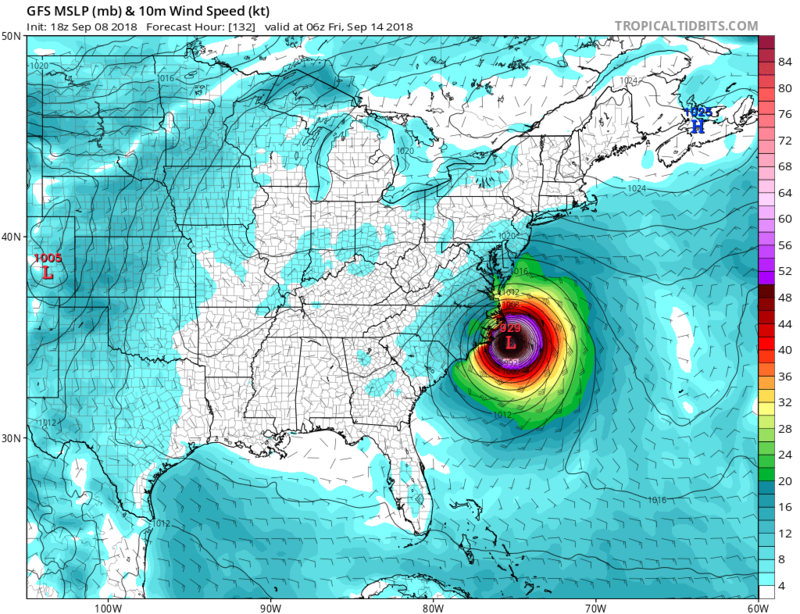 Noon Monday September 10 Entry 4 Days until Landfall – I remain concerned that Florence comes up and just never makes it to the coast. It ends of stalling and looping off the coast before heading out to sea. 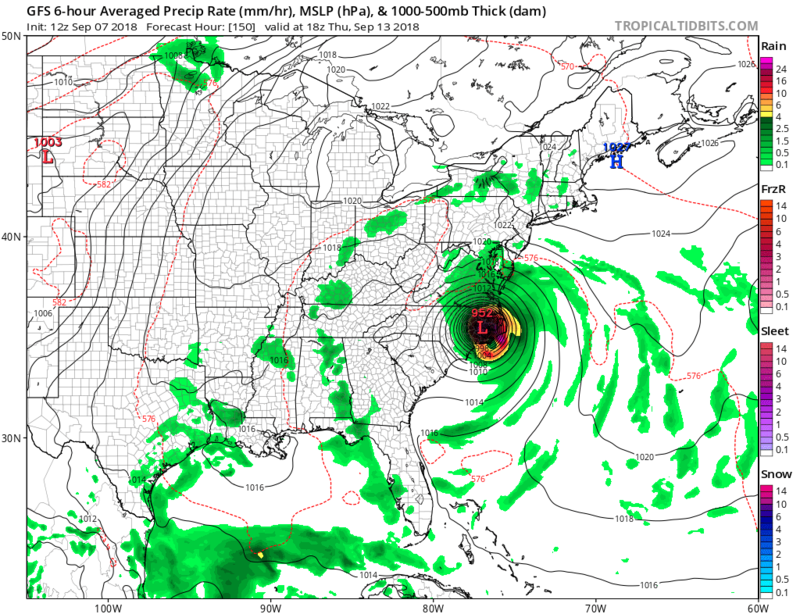 History has told us they never make it back this far and GFS continues to show the stalling as does the NAM. Something that we need to consider and try not to get sucked too much into the Euro disaster scenario. GFS 12z stalling and looping. 7am Monday September 10 Entry 4 Days until Landfall – So the clustering of tracks is honing in on North Carolina for landfall Thursday night. This is going to be a dangerous storm when it makes landfall and even after landfall with wind damage well inland and flooding on epic terms. 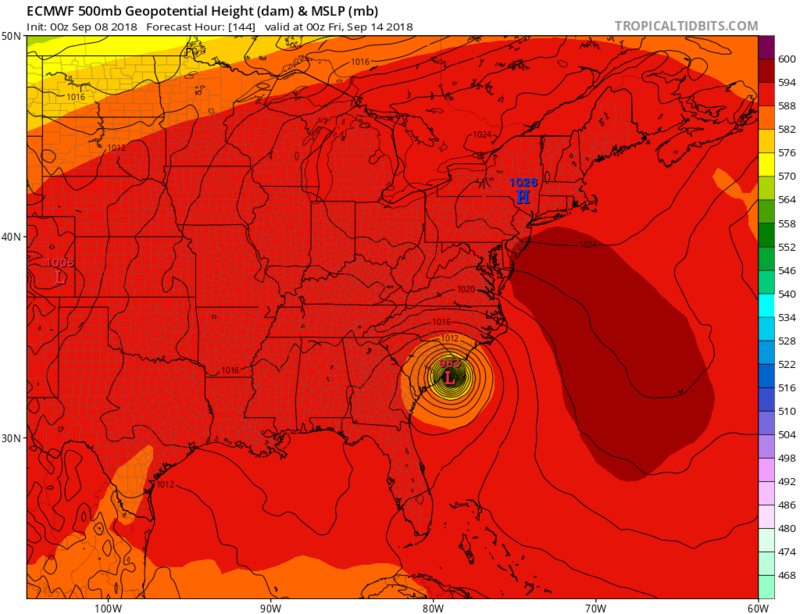 The GFS seems to be the right of the track while the ECMWF seems to be left of the NHC track. 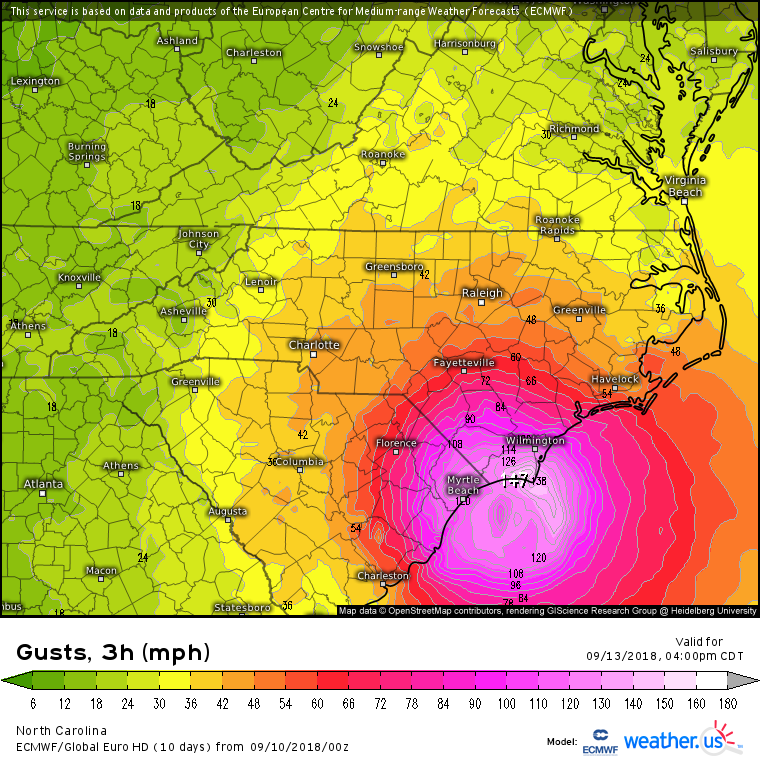 I like a landfall near Wilmington, NC but as a slowing storm and stalling storm which means big problems. 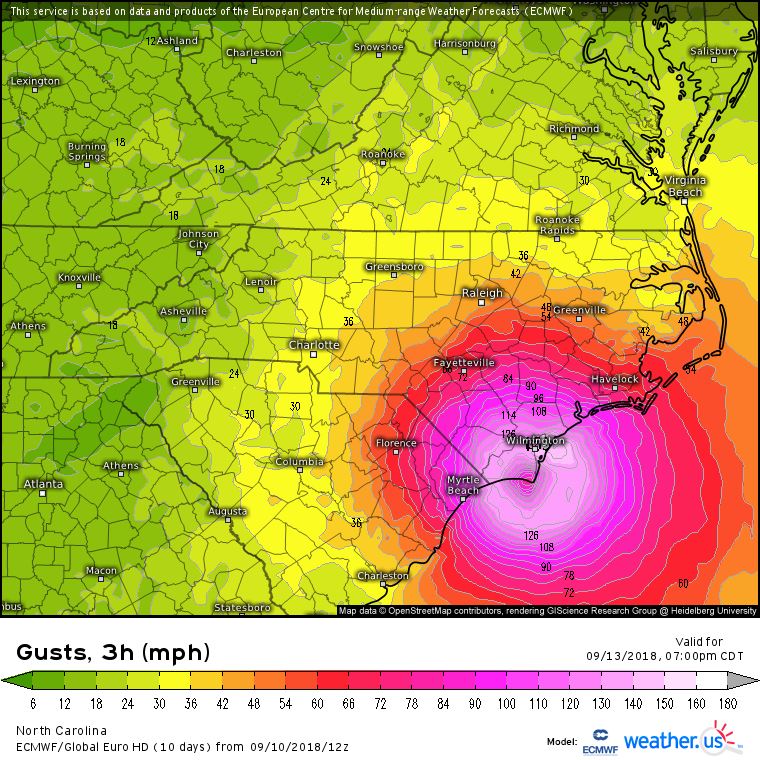 If you remain on the coast when Florence hits, you can be killed. Think of this storm as a huge EF-3 tornado that will buzz down trees and do extensive damage to property. Then we have the flooding which will be measured in feet. So the only thing I can say is prepare now. 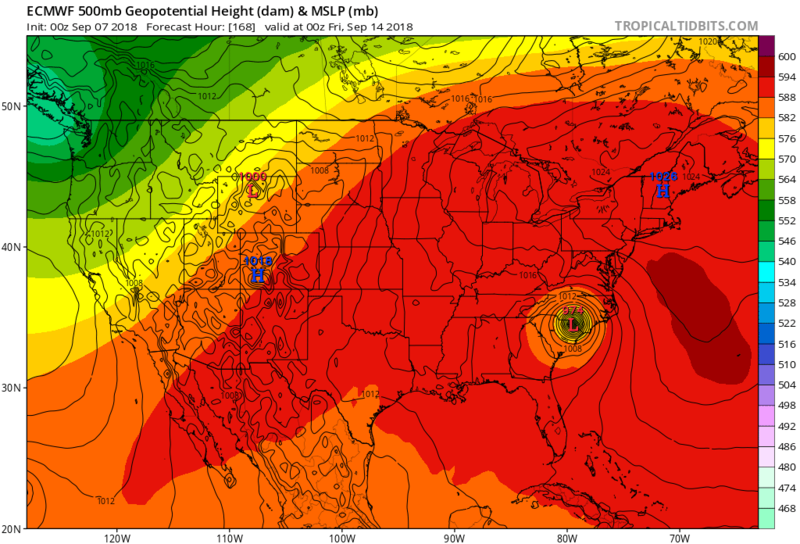 3pm Sunday September 9 Entry – So below are images from the ECMWF model showing what we are up against if a direct hit happens followed by a stalling of the storm. 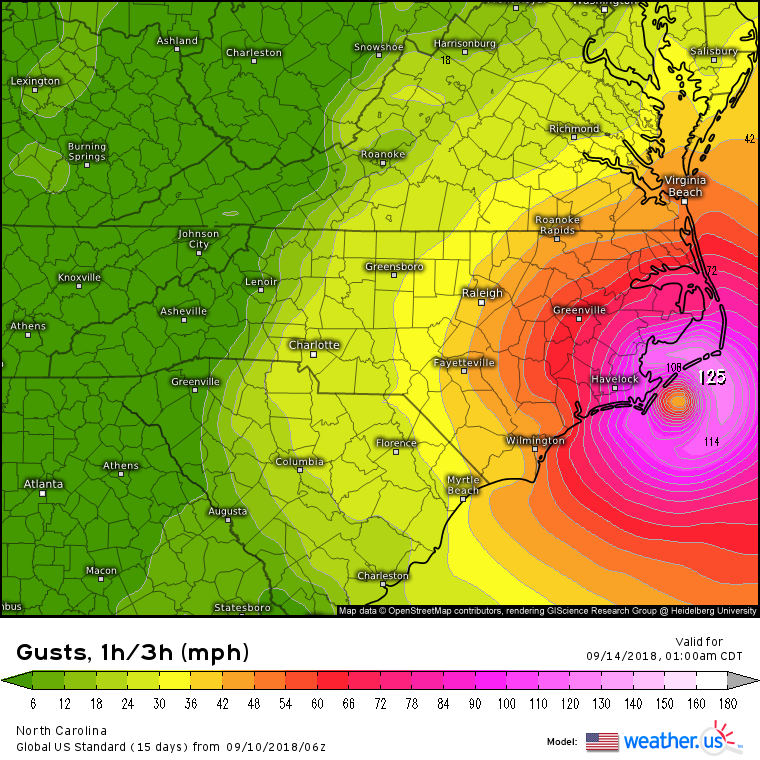 We are talking winds gusts well inland of over 100 mph and almost 3 feet of rain. The images will just blow you away. 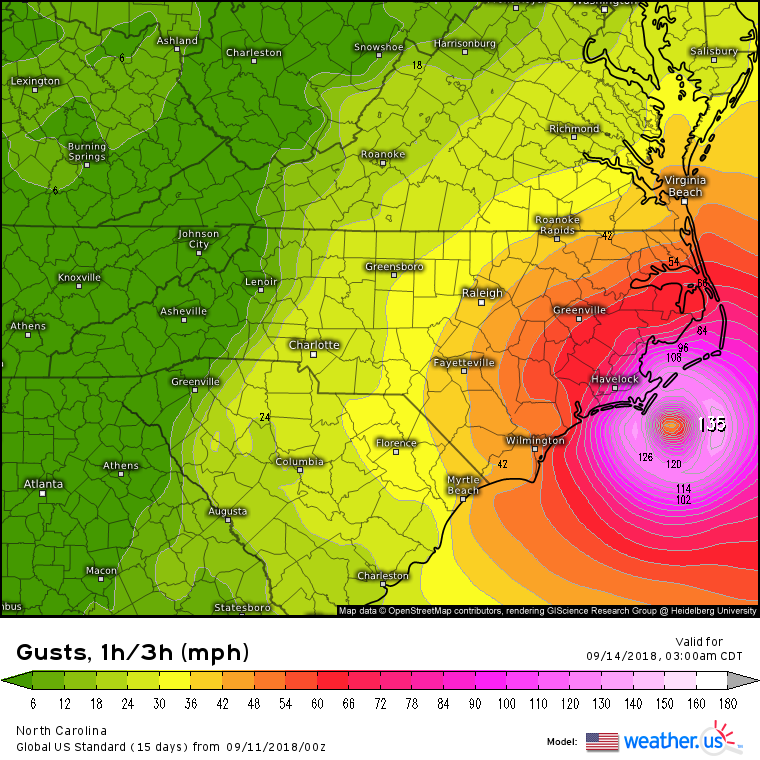 Now the GFS says, nope not coming inland but still bad storm for the Outerbanks with wind gusts over 100 mph. 10am Sunday September 9 Entry – Below you will find the track map that Steve and I put together this morning. I am also including all model maps too. A couple of key points. Track is still 6 days out so adjustments will occur. 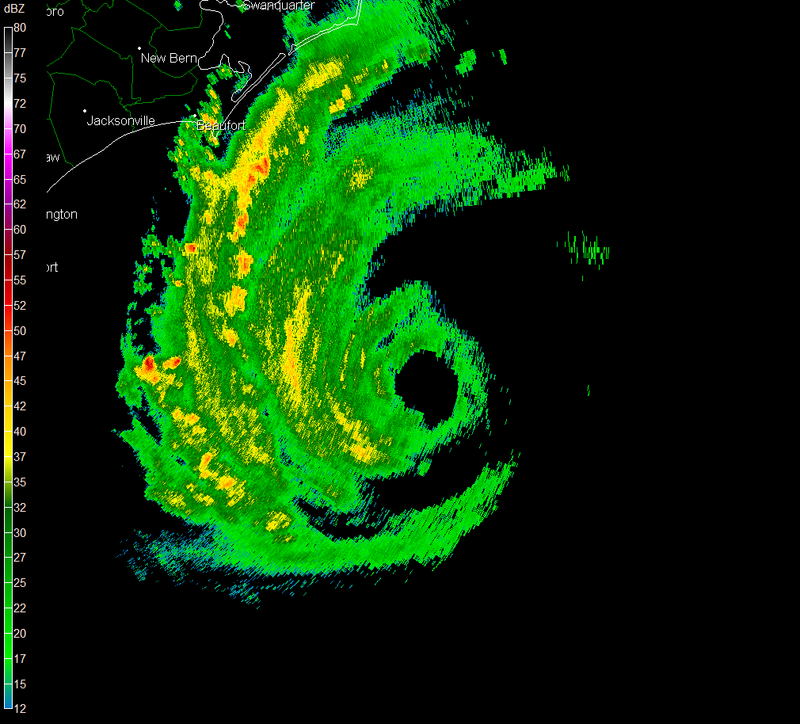 NHC is making landfall near Wilmington, NC. Again that can change. Florence could still recurve and stay just off the coast, only brushing the coast with wind and rain. Stalling and looping will occur some place. 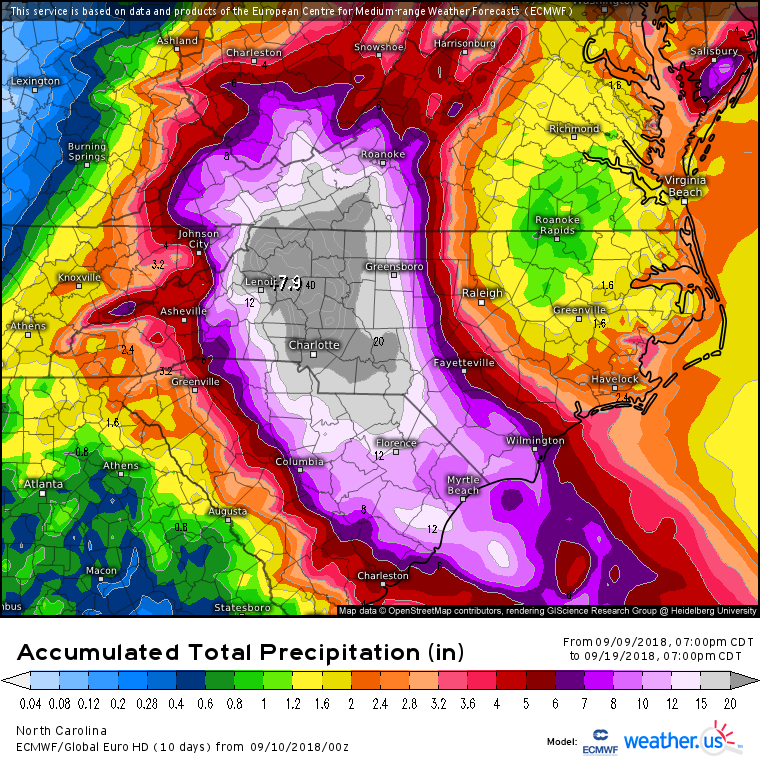 If over land, we have big problems with massive flooding. Florence will be a major hurricane. If landfall, 3 or 4, not 5. I don’t know of any cat 5 storms that far north. 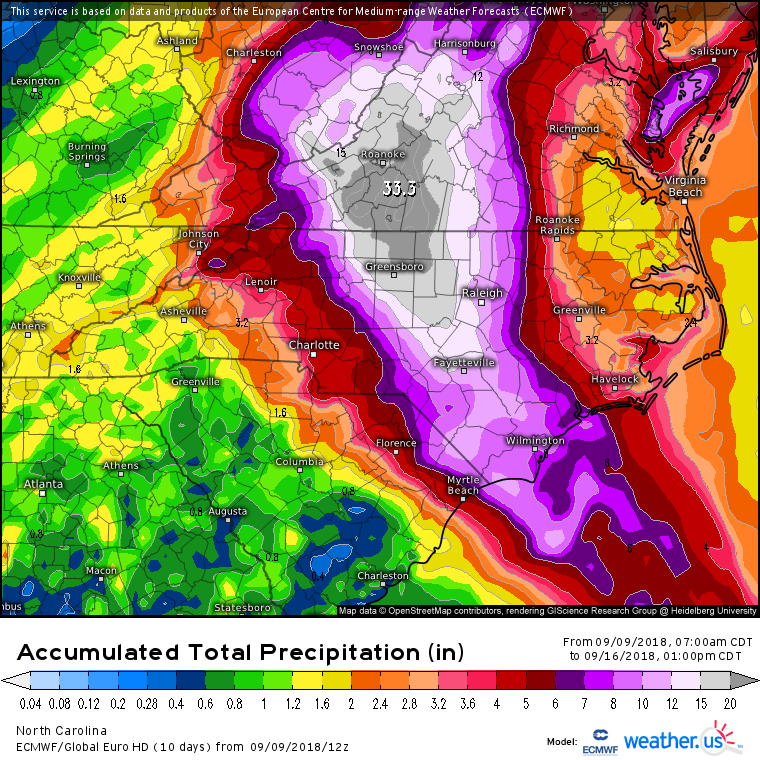 If you are on the NC coast, listen to the Emergency Managers. 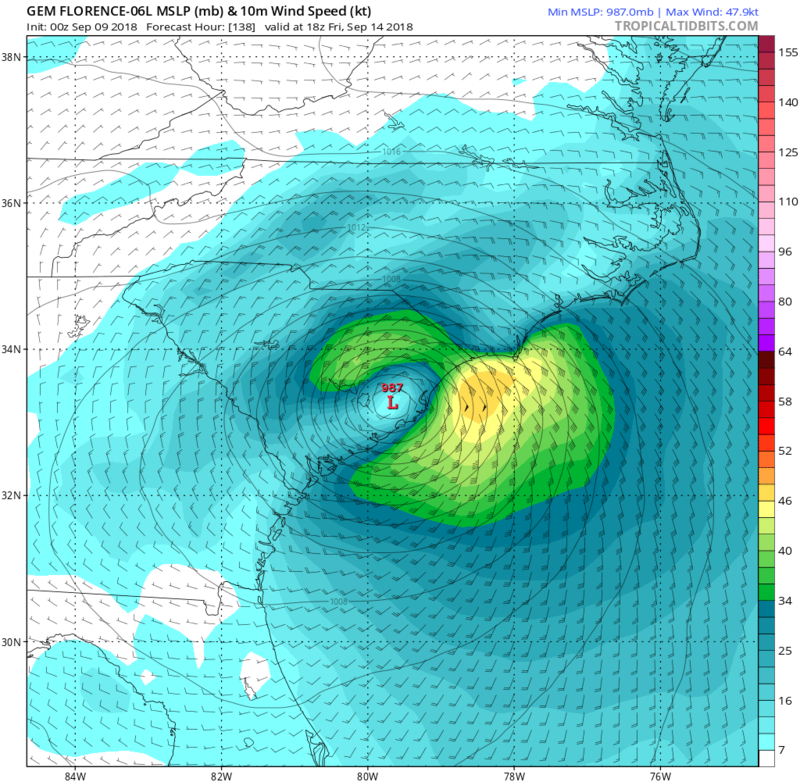 6pm Saturday September 8 Entry – I lot of people are already slamming the Carolina’s with Florence despite the storm is 6 days away. Wrote this on twitter. “I still think you have to respect the fact the Florence may scrape the coast, loop and head out to sea and never really make landfall. 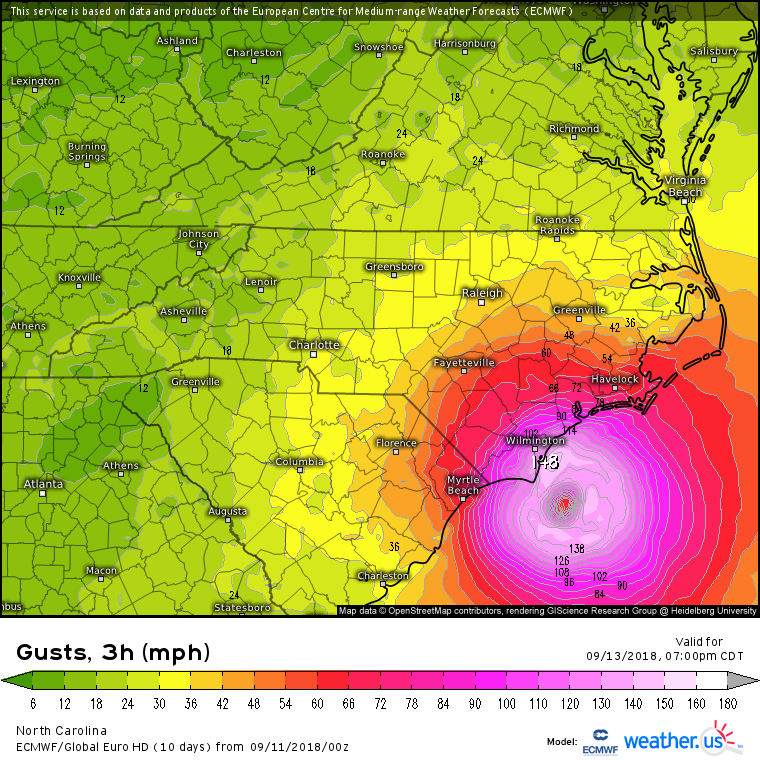 At 6 days away, still a lot of things to consider.” I know NHC has put their necks out there with the track map pointing right at the Carolina’s the all the big companies are scaring the crap out of people for pageviews. I still think, Florence may miss after scraping the Outbanks. 8am Saturday September 8 Entry – Trends overnight have been toward the central U.S. East coast. 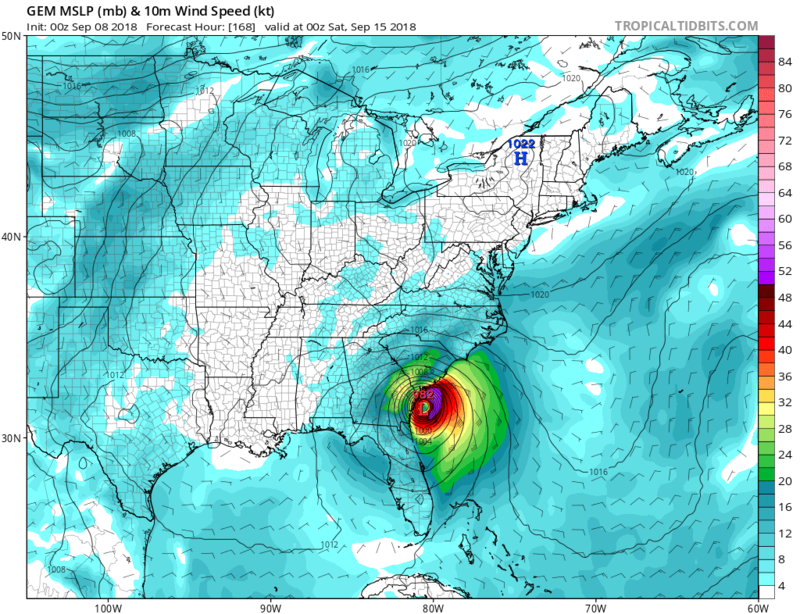 I did notice that the GFS backed off the landfall and is just scraping the coast and doing the loop as I expect will happen. 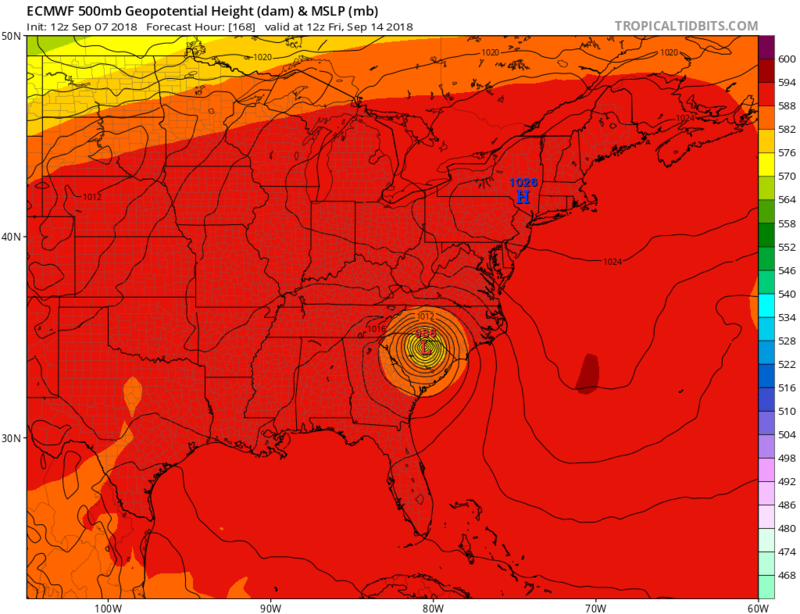 Euro continues to take it inland. I am still leaning toward a solution of approaching the coast, making a loop then heading out to sea. Given the wet summer and potential for massive flooding, I am hoping this will be the case otherwise we have bigger problems in the form of flooding and wind damage. NHC map is pointing toward the coast as a major hurricane but I can tell they are leaving room for a turn to the north on the next maps. I plan on doing my map Sunday as we will be in the window of prediction. Major hurricane hit on the East coast. Major flooding event coming up the Appalachians into the Mid-Atlantic following Gordon’s heavy rains this weekend. Damage risk from wind and flooding could be very bad. 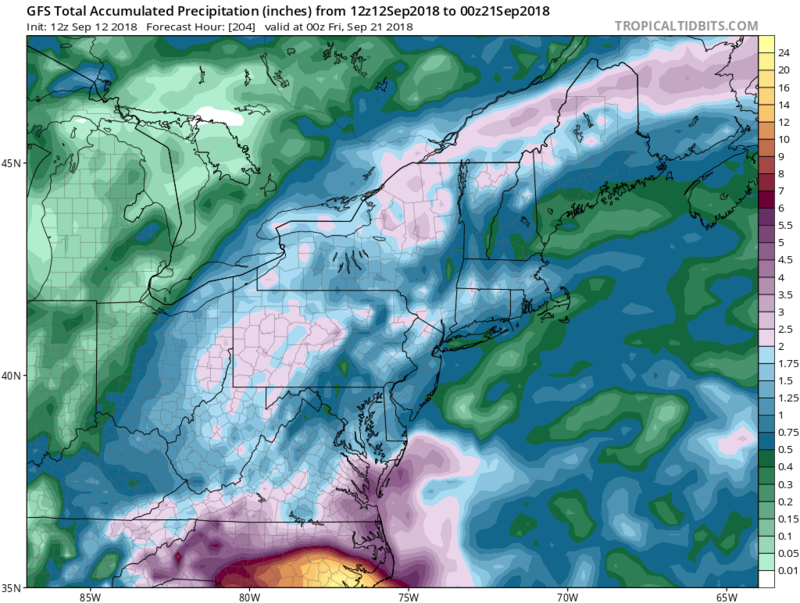 I have been saying since Mid August that my biggest concern was a tropical system coming into the flood zones of the Appalachians and eastern PA could result in massive flood event which takes the rives out of the banks. I hoping this is not true. 6am Friday September 7 Entry – I just figured out it’s September….lol. 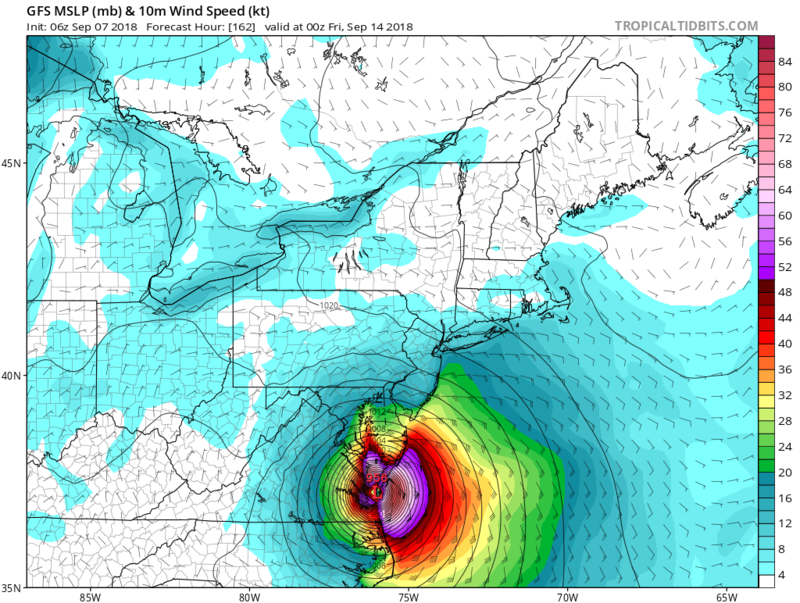 Anyway, the operational models shifted west again with the EURO making a Carolina’s landfall and the 6z GFS taking Florence up the Chesapeake Bay and makes the loop. 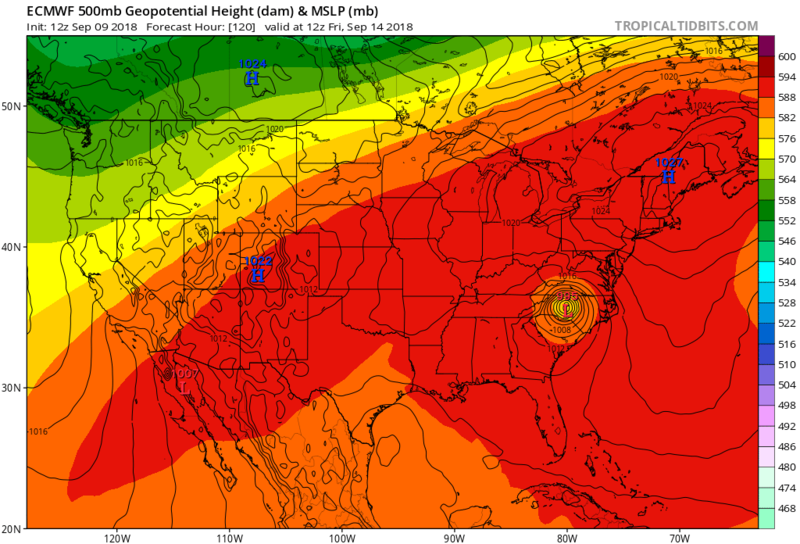 The Euro Ensemble spread was toward the coast with the UKMET taking Florence south into Florida. So nothing concrete in the track, so will keep a wnw track for now as ridge continues to build over Florence. Maps below are only for reference and should be NOT be used as actual forecasts. Click on them to see larger image. 9pm Thursday September 6 Entry Florence was downgraded due to some shear but will become a hurricane again. 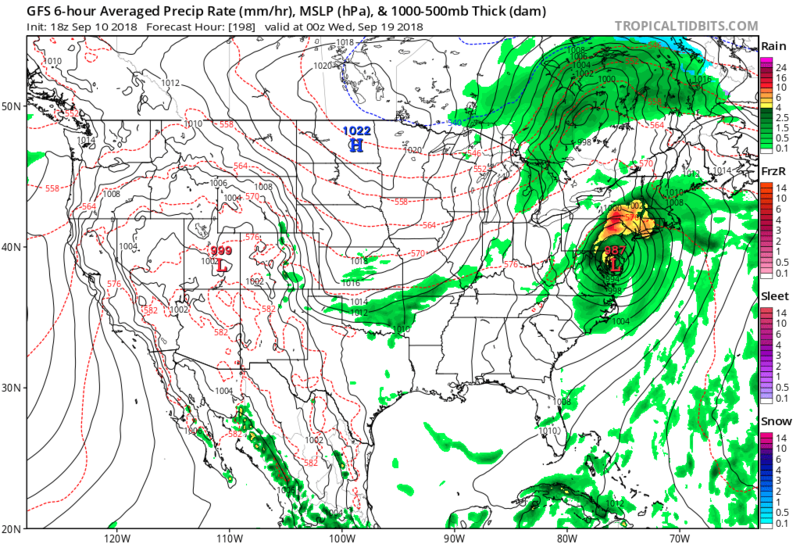 18z GFS was near the coast but out to sea and looping around. 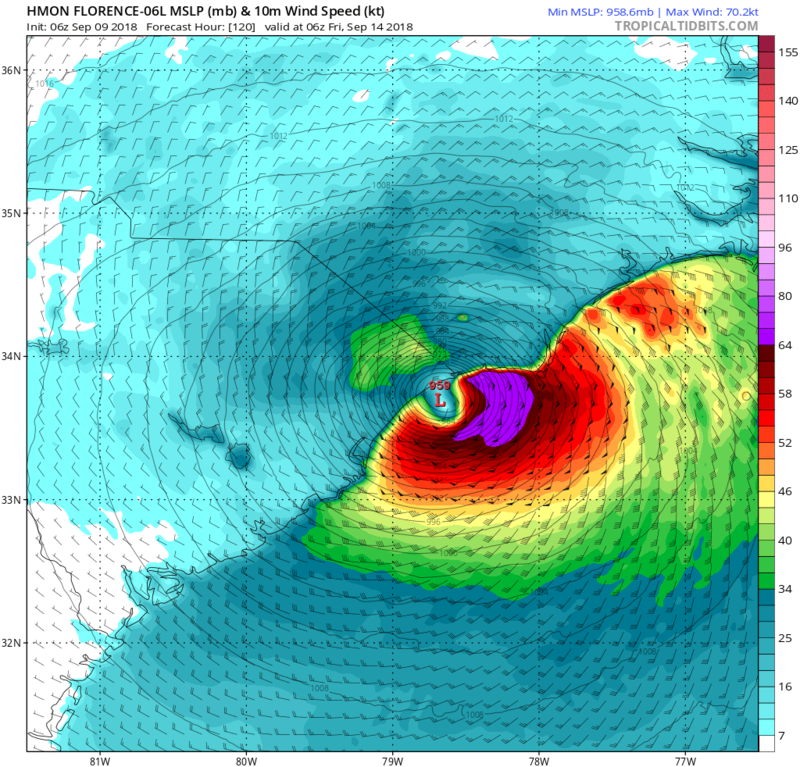 3pm Thursday September 6 Entry – The operational models all bring Florence back into the coast and loop it around. We know that the loop or stalling of the storm is a real possibility because of the ridge building over top and to the north so there is no where for the storm to go. The key is the ridge and how strong the ridge will be. Looking more like Florence is missing the chance to get out. Click to see images. 9am Thursday September 6 Entry – Not going to put out a track map yet as it’s too early and too premature. While the operational models are playing the usual games with the storm we need to look at the facts with a storm over a week away. 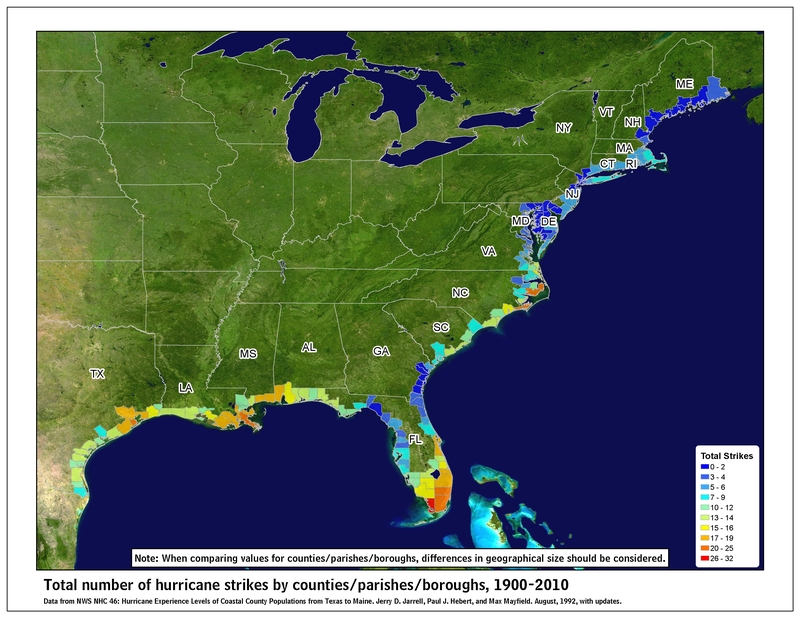 History has shown us that storms from that area don’t make it back to the U.S. coast. although pointed out by Sam Lillo, Florence is north of all the major hurricane tracks so something to consider. The Operational models will not do very well with the track of the storm so stop looking at them. 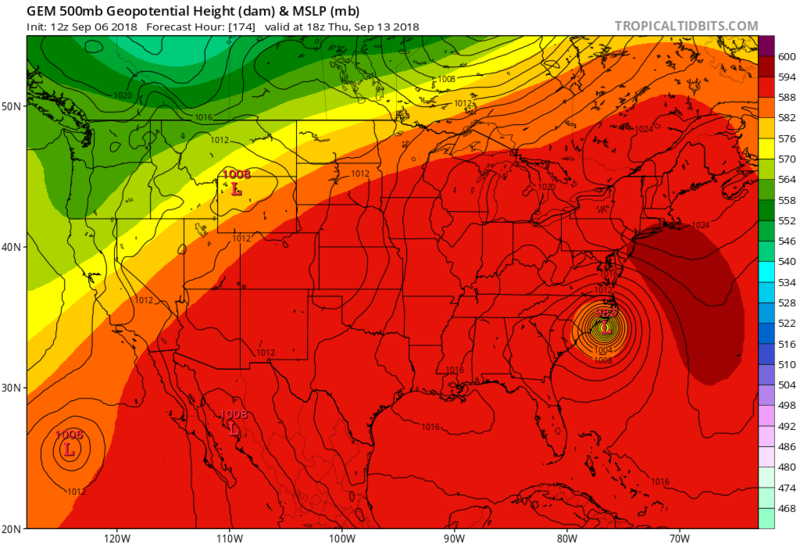 Even the 6z GFS is funny this morning with Florence out to sea and another hurricane hitting the coast from the Gulf of Mexico. 3. 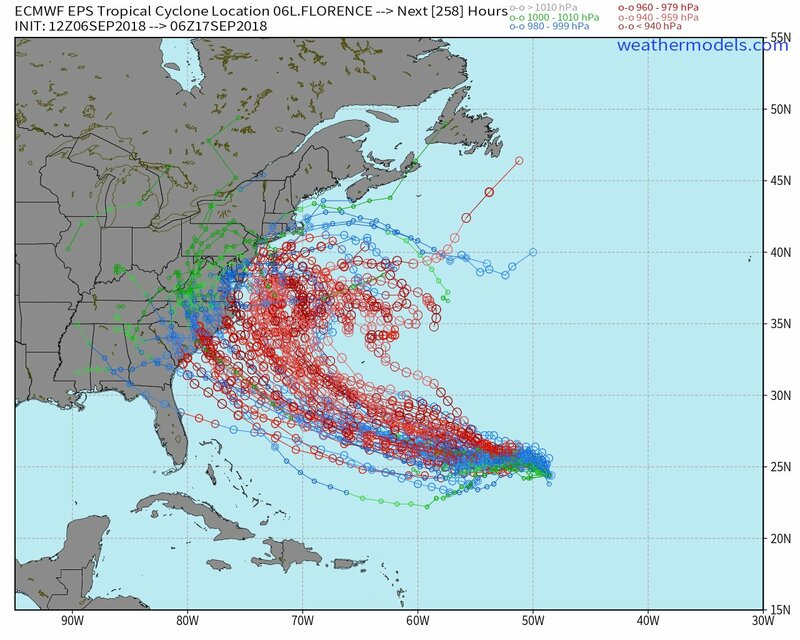 The hurricane models have remained consistent with the track, recurving Florence to the northeast. 4. Ensemble models shifted west overnight but could shift east anytime the next couple of days. Ed Vallee pointed out that the escape route is closing on Florence. 5. Florence is a major hurricane and them typically plow in a straight line until something can deflect it into another direction. Right now, no trough is predicted into the eastern part of the country, only a huge ridge building in next week. That’s my points for this entry. Thanks for the update. I know I can depend on you. Henry: thanks for posting and keeping us updated.any thoughts as to why you feel it is going to curve up the coast? is the ridge going to weaken? 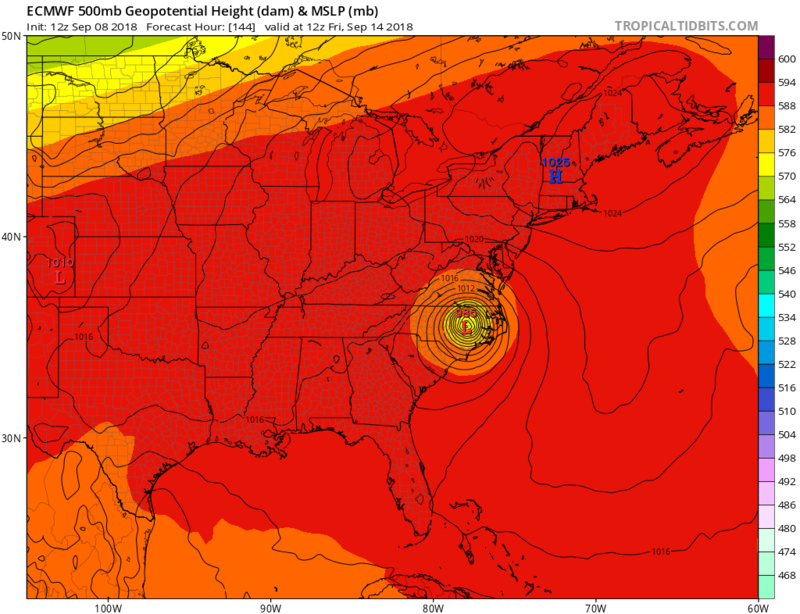 As of Sunday, 10AM: IMO….ATM: All of the models you showed have it inland too far south. The GFS has it right. The NHC track will go north in the next couple of updates.